Published on May 11, 2016 by Martyn. Be the first to comment! 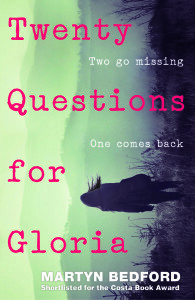 The Canadian edition of Twenty Questions for Gloria has hit the ground running with two great, high-profile reviews. Published last month by Doubleday, in Toronto – the same Penguin/Random House imprint as my two previous YA books – the novel has already found favour with critics at CM Magazine, one of Canada’s more prestigious literary journals, and the influential Joyous Reads book blog. To read the reviews in full please click on these links: CM Magazine, Joyous Reads.